Whether you are simply looking for bookshelves to store books, or wanting an entire room crafted in the finest quality bookcases, let us show you what we have to offer. 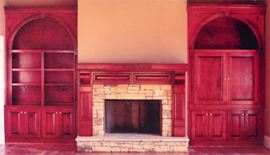 If it's a custom entertainment center you are after, we can handle the job. Few can match our arched, elliptical, and more tradition styled pieces.